Various sources of information were gathered and analyzed to choose the winners of each category. The 2016 Annapolis Award Program focuses on quality of service provided. The category winners are determined based off the information gathered internally by the Annapolis Award Program and the data provided by third parties. The Annapolis Award Program is an annual awards program honoring the achievements and accomplishments of local businesses throughout the Annapolis area. Recognition is given to those companies that have shown the ability to use their best practices and implemented programs to generate competitive advantages and long-term value. 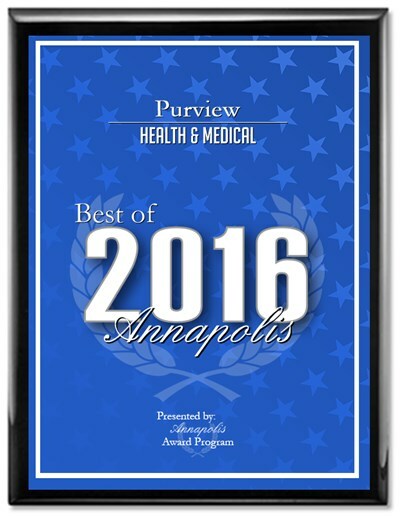 The Annapolis Award Program was established to recognize the best of local businesses in our community. Our organization works exclusively with local business owners, trade groups, professional associations and other business advertising and marketing groups. Our mission is to recognize the small business community’s contributions to the U.S. economy. Purview is an Annapolis, MD-based technology company focused on disrupting the medical image industry by enabling enhanced access to medical imaging studies for physicians and patients. Purview facilitates viewing, access, archive, and sharing of medical images such as x-rays, MRIs and CT scans, anywhere, anytime on any device. Purview’s mission is to improve medical outcomes by integrating these images with the patient’s electronic medical record.